The Arc of San Diego provides services to approximately 2000 infants, children and adults with developmental disabilities. These services are provided throughout the city and county of San Diego. There are five centers and the ARROW Center is one of those locations. The Arc of San Diego believes people with developmental disabilities have the right to chose and realize their dreams and goals of where and how they learn, live, work, and play. The Arc of San Diego, working with families and partnerships within the community, is committed to securing with people with developmental disabilities the opportunity to exercise these rights to choose and to realize their dreams and goals of where and how they learn, live, work, and play. The ARROW Center places an emphasis on the participants building ties with their community. This includes volunteer opportunities, community education or training, leisure activities and building of natural supports within the community. This program offers opportunities to experience making choices and experience presence and inclusion in the community. The art program at ARROW Center encourages adults who are developmentally different to experiment with a variety of art media in a relaxed and relatively unstructured setting. Participants have painted on canvas, paper and found objects. They’ve manipulated paper Mache and dough art, then embellished the finished product. Magazines are a source of imagery for collage. One participant, Jim, loves using the staple gun and enthusiastically helps stretch canvas over frames. When asked why she glues pictures of babies onto rocks Norma responded, “Because I love babies!” Dulci is captivated by paper and cardboard. 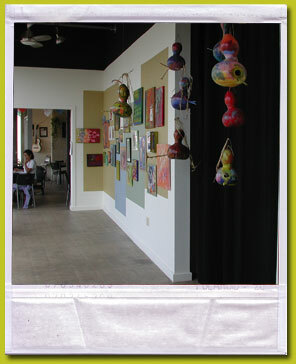 She has arranged found objects onto her mixed media pieces which are sparce and spontaneous. While Dulci works fast and furious Debora is methodical. She is intrigued by patterns. 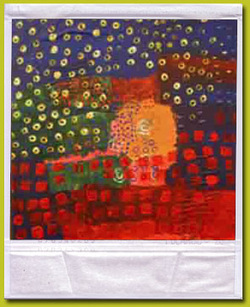 Her work is reminiscent of the dot composition of Australian aborigine art. Many of our participants are non-verbal. Art for them can be a vehicle of self expression, a way of being seen, their voice heard in color, texture and form.